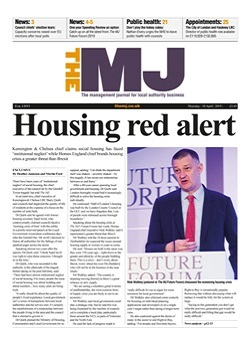 The key ingredients of financial sustainability have been outlined by a senior sector figure speaking at The MJ’s Future Forum. The way auditors examine council accounts could be overhauled, the National Audit Office (NAO) has suggested. The Ministry of Housing, Communities and Local Government (MHCLG) has brushed off criticism from a top auditor. Councils have urged the Government to introduce a more streamlined approach to providing new burdens funding for Brexit-related costs, The MJ has learnt. Local authority commercialisation will further come under the spotlight, with the National Audit Office (NAO) preparing to launch an inquiry. John Tizard and David Walker make the case for a new way of auditing how public money is spent that uses evidence before spending decisions are made - and includes a new office of the '3Es' (efficiency, effectiveness and equity). The remit of the National Audit Office (NAO) should be extended to cover local government, a new report has concluded. Labour has called for the National Audit Office (NAO) to vet the outcome of the local government fair funding review. A nine-fold variation in spending on children’s social care could largely be down to ‘differences in characteristics’ between councils, according to a National Audit Office (NAO) study. Are reports of the death of PFI an exaggeration? Critics initially welcomed the announcement of the end of controversial PFI schemes. But central government and councils may continue to draw up contracts which use private finance-style mechanisms. Hiba Mahamadi asks what could lie ahead. The organisation representing legal and governance council officers is to push for a Government review of the status of monitoring officers. The number of public bodies in England with weak financial plans is ‘unacceptably high,’ the National Audit Office (NAO) has found. Gareth Davies has been put forward for appointment as comptroller and auditor general at the National Audit Office (NAO), replacing Sir Amyas Morse. Ministers are ‘ramping up’ planning for a no-deal Brexit as the prospect becomes more likely.